DD5LP/P – May 25th 2016 – DL/AM-001 Peissenberg. Following an unsuccessful attempt to contact the SOTA activators on Norfolk Island two days ago, this was another attempt. In the mean time however there had been constant rain and hence access to my closest summit (Berndorfer Buchet) would certainly be washed out. As I could not have any delays, as this activation again had to be very early (pre 8am local time), to hit the long path window, I decided to head to a drive up summit instead. 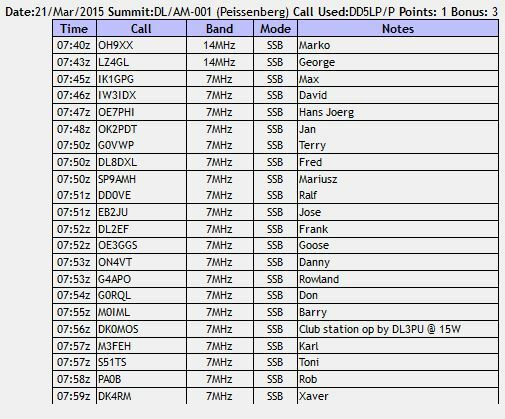 I have regularly activated Piessenberg, so I would not obtain any activators points for this summit but the purpose of the trip was to try to get another VK9 summit in the log, so activator points were not important. I checked the already packed bags the day before the trip. I can now simply “grab and go” with my SOTA gear. Only if I intend to have a long activation or multiple activations, do I need to pack additional hardware (mainly batteries)..
Pessenberg (or Hoher Peissenberg to give it its full name) is about 45 minutes drive away from home. It has a beautiful and large church on the top, which was getting its annual outside repaint job when I was there. The location I normally use has the antenna running roughly east-west meaning radiation from the dipole would be going north-south – 90 degrees away from my ideal direction for long path. In fact given that the large church is directly north, the antenna probably only “sees” south perfectly. That said, with the centre of the Inverted V at only 5 metres above ground, most radiation will be going almost vertically in any case (NVIS). Prior to setting up, I did take a look at a track that runs off from the car park in a north-south direction, but this dropped off far to steeply and there was no likely spots to set up at. I also took a look at the end of the church. This location would be fine for a vertical antenna but a dipole would cross two paths, that are well used. So in the end, I was back at my usual location on the south side of the church. Out of bed at about 5:30am and prepared and off by 6:15. The drive down was fine, the traffic wasn’t too bad and of course, I knew the route. On arrival I found Peissenberg, in the clouds – a fine day was forecast but it seems the clouds were hanging on as long as they could! As discussed under “The location” above, on arrival, I scouted an alternative set-up location but ended up back at my normal spot. I listened for a while and monitored for spots from Ron VK2AFW/9 on Norfolk Island. I decided as Ron was still spotted being on CW on 40m and 20m at 05:30 UTC, I could put out a call and check conditions. I managed a Greek, a Swedish and an Austrian contact but these took some time. It seems that I could not get to most of Europe (I think the skip distance was long at this point). I can normally work Mike 2E0YYY/P in the UK and he was spotted but I could not hear a thing on his frequency. At about 0600 UTC conditions changed though and I had a run of contacts from all around Europe. 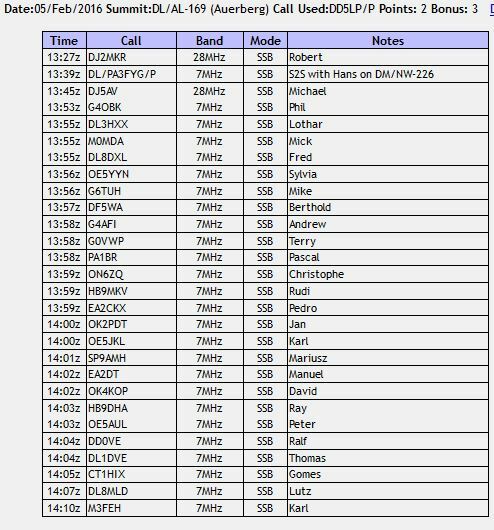 When I saw Ron spot on 14.310 – which is the frequency I hade been on for the last 40 minutes, I cleared the frequency to give Ron a chance at some EU SSB contacts. I thought I heard something in there, but so weak, I would not be able to work it. I then managed an S2S with Mike 2E0YYY/P in the UK, and found he had also looked for me earlier and heard nothing. It seems that about 0602 the skip changed for long to short and that was the end of any Long Path chance of a contact with VK9. Following my short chat with Mike, I took one last listen for Ron (who it seems had been able to work into Japan, but not Europe) and then I packed up and left. No success yet with a contact into VK9 but again the kit worked faultlessly – the problem was the propagation. Perhaps there will be another opportunity for a VK9 S2S contact before the group leave early next week? I will check out the location at the end of the church, the next time I activate Peissenberg. After re-activating Weichberg about 10 days earlier, when I could not get access to Eisenberg, I realised that even though I did not get the points for the summit, I did get the bonus points for activating while in the winter period. 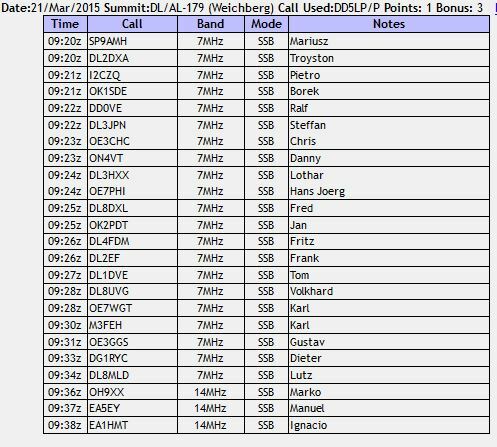 Weichberg was successful in bagging my first summit contact into the US with Eric W4EON in the W4V association. Eric has been kind enough to try to put on activations at his end when I have been able to get out to a summit here (we have had no success with me chasing from home – I simply cannot hear the US stations over the local RF noise with my not-ideal antenna on the bands where the contacts can be successful. 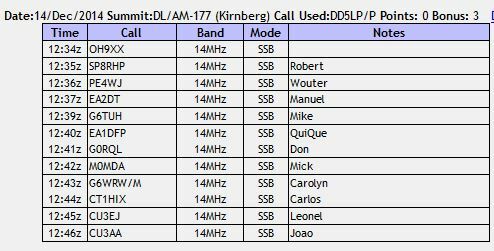 So I have been trying to set up a second contact with Eric on a different W4V summit, so that I can get my required 3rd. continent for platinum level in the Maountain Hunter award. 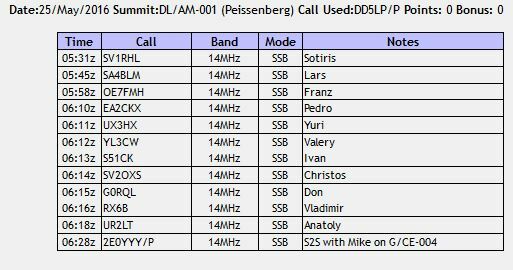 The forth of these summits (DL/AM-001 Peissenberg) was the one where I could be at, for the arranged time to try for the contact. The first three summits were three that are easy to activate and I could build into the loop route to pick-up the winter bonus points from all four summits by re-activating them. I have done some work with my Diamond RHM-8B vertical mounted on a photo tripod and the antenna analyser gave me a good report for its use in this fashion, on 40, 30 and 20m – all with an SWR of 1.3:1 or better. So my plan was to take advantage of the quick set-up and take down of this antenna and bag 4+ contacts on each of the first three summits and then concentrate on setting things up on the forth summit for the trans-atlantic attempt. 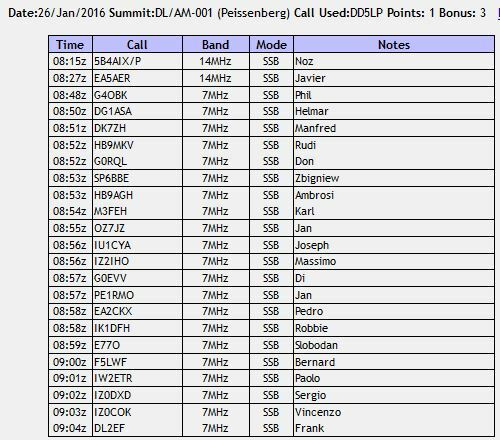 DL/AM-001 Peissenberg and 2nd activation. By clicking on the names above, you can find information about all of these summits from my earlier activation(s) of them. 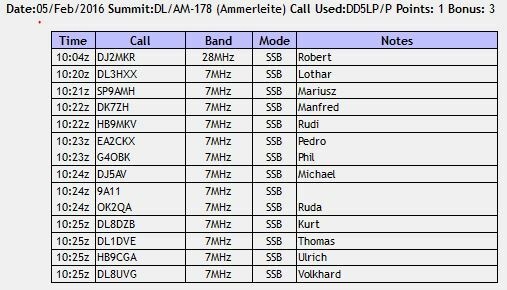 Although I managed all four summits DL/AM-176 Rentschen, DL/AM-177 Kirnberg, DL/AM-178 Ammerleite and DL/AM-001 Peissenberg, it was not without some “Challenges”……. I had hoped to keep the first three very easy and fast just operating on 40m with the vertical on a tripod. It was not to be. 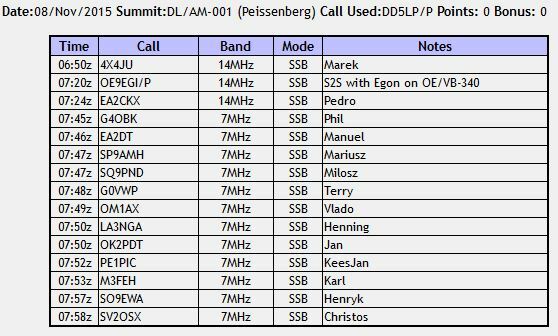 I found out at my first summit (Rentschen), that there was an Italian SSB contest on 40m – so there were NO free frequencies and any that seemed like a free frequency were splattered across by the over modulated 3KW+ station 5 KHz away! So I decided to switch to 20m on the vertical only to find the SWR on 20m was horrible (it had been 1.3:1 when I tested it on the antenna analyser two days previously). So I had to unpack the mast and linked dipole, which I had luckily with me as a backup. All of this added to the time on the first summit meaning I lost the time that I thought I had spare as I had set off 30 minutes earlier than planned from home. At the next summit, Kernberg, I managed to bog my car while parking before even getting to the summit. Luckily the summit is next to a farm and the farmer (a real Bavarian gentleman) pulled me out with his tractor. So summit number two ran over my time scheduled. By the time I got to my third summit, Ammerleite, time was still slipping away and on this summit apart from the fibreglass pole repeatedly coming down when I was trying to put the OCF dipole up everything went OK. Once I finished and packed up however I was very short on time to get to summit number four, Peissenberg. When I arrived I found that a large piece of the forest where I used to fasten one end of the dipole into, had been cut down. There were also far more people at this (easy to get to) summit that I have seen here before. I found an alternate anchorage point for the dipole and then set-up fairly smoothly however the extra people around, several wanting to know what I was doing, also took some time out of the schedule. Some how I managed to get on air just 5 minutes late. Unfortunately conditions on 10m and 15m were not as good as they have been and the 10m ARRL contest did not make things easier. 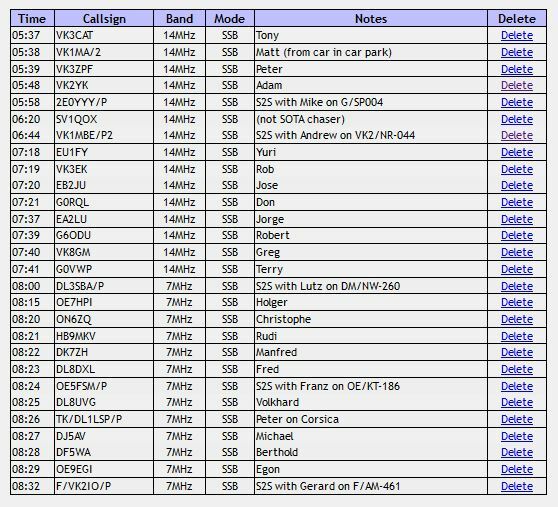 Although I managed a contact into Virginia, it was not with Eric W4EON/P on his summit, rather Arno W4AKO who was able to hear Eric and me but I could not hear Eric and he could not hear me. Perhaps next time …. All in all a trying day of SOTA activations but enjoyable as well. Some chasers worked hard to work me on as many of the summits as possible, Manuel EA2BT (one of the few calls where I rember the name) and Mick M0MDA both managed to contact me on all but the first summit, where the QRM on 40m was horrible from the Italian contest, Carolyn G6WRW had a remarkable signal from her mobile and contacted me on two of the summits as did Don G0RQL, Robert SP8RHP, Bill G4WSB and Leonel CU3EJ. It’s really nice to have contacts with the same chasers from multiple summits. It’s also nice to hear the regular chasers each time I go out. It really makes one feel part of the SOTA “family”. Diamond RHM-8B loaded vertical, SOTABeams linked dipole & Aerial-51 model 404-UL asymetric dipole. Do NOT assume the ground is solid when parking a car and then when bogged, do not try to get out yourself (it only makes it worse). Try to avoid weekends when contests are on – mid week activations have a better chance of long distance contacts especially when only running 5W of SSB.